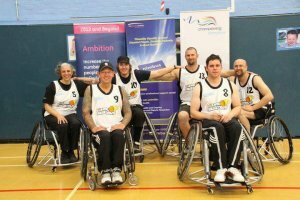 Robin with Wheelchair Blazers team-mates. 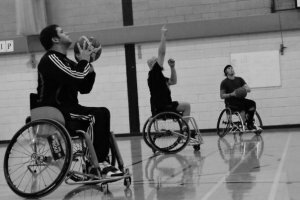 As head coach of the Derby Wheelblazers Wheelchair Basketball Club, Robin Gaze is never more pleased than when he sees young players realised their disability is not a barrier. Here, he tells us his coachinig story. "I'm originally from Ipswich, but after studying at the University of Derby, I never left! I live in Derby City, and have done so for the last 13 years, and have been part of the Wheelblazers for eight years. After joining the Wheelblazers, I wanted to give something back to the team and that's when I started doing an assistant coaches course, just to help out. "I found that I really enjoyed helping the progression of juniors and so decided to push myself to become a full coach. "I've coached the Wheelblazers for six years now, having played for them for eight. I have helped mentor a couple of our players to become coaches too. "Before I became a coach for the Wheelblazers I hadn't done any, even though I was always sporty but coaching was something I had never looked into. 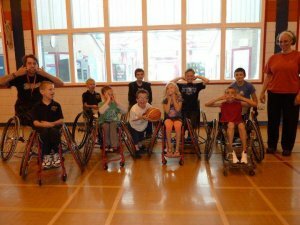 "Seeing new juniors realise that their disability is not a barrier to them competing in sport the most rewarding part of being a coach for me. Having fun coaching junior players. "I've seen a number of players grow in confidence and skill and mature into great sportsmen. I hope that my influence, as their coach, has had a part to play in this. I would like for my juniors to be ambassadors for wheelchair basketball. "I have a broken spine and I used sport as part of my rehabilitation. My disability helps me to relate to my players and enables me to adjust my coaching to meet their individual needs. "As a coach the most important thing I have learned is patience. I have always been quick to pick things up, but coaching has helped me to understand that there are multiple ways to learn. "If I want to be a successful coach, I have realised I need to approach different tasks from different angles so that all of my players can progress. "I've learnt to accept that this may take longer for some players than others and I find different and new ways of adjusting my coaching to suit them. "As a coach you can always learn more, I hope that I continue to be challenged by the club and never stop progressing as a coach." The Wheelblazers welcome players of all ages. If you have a disability and need funding support to get a coaching qualification, check out the Coaching Derbyshire disability bursary. 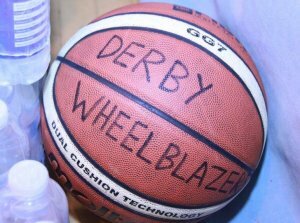 Find out more about the Derby Wheelblazers and to look for opportunities in disability sport and Wheelchair Basketball in Derbyshire.